New York - September 11 at 8:00 PM: I just walked back from what used to be the World Trade Center. You can forget about anybody being alive in there. Nobody could have survived that. They are all dead. I stood next to a WABC Newscaster as she gave a live report. Most of what she said was nonsense. She claimed that rescue workers were pulling victims from the rubble. Someone must have told her to say that, because there is no way that rescue workers could even get close, much less pull victims from the rubble. I got real close. I evaded the police and made it to the corner of Fulton Street and Broadway, next to the St. Paul's Church and only one block from what used to be the World Trade Center. Nobody, not even firemen, was closer than I was. Thousands of firemen were standing around behind me doing nothing. There was nothing that could be done. They are simply not equipped to deal with a 47-story building that is ablaze. I walked away and just a few minutes later Building Number 7 collapsed. I did not see it fall, but I heard the explosion. All the street lights went out at the same time. Since about one and a half hours passed between the times that the airplanes hit and the buildings fell, I was hoping that there was enough time for at least some of the workers to get outside. However, walking across the Brooklyn Bridge on the way home, a woman walking next to me said that she lives at 176 Broadway, across the street and one block away from the World Trade Center. 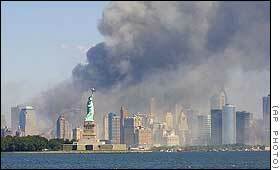 She said that she was looking out the window when she saw the second airplane crash into the South Tower. She stayed at her window throughout the next few hours, because she was afraid to leave and thought that she would be safer inside. She remained there until 4:00 PM, when finally the gas and fumes forced her to leave her home. She said that she saw only a small number of people leave the World Trade Center after it was hit. Her estimate was that only about 1500 left the building between the time the airplanes hit and the time the buildings collapsed. Apparently, office workers felt that they were better off staying inside the World Trade Center, to avoid being hit by falling debris. Nobody thought that the entire buildings would collapse. 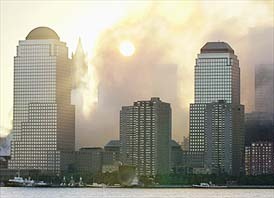 At the time that the World Trade Centers were hit, I was sitting safely in my home in Brooklyn. When I heard the news, I decided to go to see what was happening and possibly to join in the rescue effort. The A Train was still running, so I took it to Manhattan. It could not stop at Broadway-Nassau or Chambers Street, but it did stop at Canal Street. I got out there. I walked as close as I could until stopped by the police. At first, I decided to wait until they put the fires out and then go pick through the rubble. There was an announcement that volunteers for search and rescue were to go to the corner of Greenwich and North Moore Streets and sign up. I went there. About a thousand people were assembled there. I signed up on one of the sheets that were being handed out. I waited. They were asking especially for doctors and trained medical personnel. I finally realized that this was all nonsense. The buildings were on fire and nobody but firemen were going to be able to approach for a long time. So, I decided to try to get closer. I started walking east. I got to Foley Square, where the court houses are located. A group of volunteers were making make-shift stretchers. They were being given wood, hammers and nails, and were hammering away to make stretchers. I realized that this too was nonsense. Nobody was going to be carried alive out of there. It will be days before the fire is put out. I started walking south from Foley Square. This time, the police did not stop me. Soon, there were no more police, only firemen. Somebody gave me a face mask. I put it on. By that point, nobody was telling me not to get any closer, so I got all the way to Broadway and Fulton Streets. I could see that Building Number 7 was on fire. The Twin Towers were, of course, long gone. I probably stood there for a half hour and then finally decided there was nothing to do. None of the firemen present were doing anything either, nor could they. Nobody was coming out from the buildings. There were no signs of life there. I turned around, walked up Fulton Street and turned left. There, I saw a television newscaster in a bright red dress waiting to give her TV news report. I decided to wait to see if she had any news. When she finally came on, everything she said was nonsense. She spoke of rescue workers pulling victims from the rubble. Total BS. There were no rescue workers anywhere near the World Trade Center. While she was speaking on TV, I heard a crash. This was Building Number 7 collapsing. This was at exactly 5:20 PM. Several people with me who had been living near the World Trade Center agreed with me. There is nobody left alive. Everybody inside is dead. As to who did this, I feel that there are only two reasonable explanations. It was either a group of Americans similar to Timothy McVeigh who blew up the Oklahoma City Federal Building, or it was the Afghans. Other groups being blamed or suspected of this, such as the Iraqis, the Iranians, the Libyans, and the Palestinians are too cowardly and disorganized to have pulled off something like this. As to how they did it, it seems that the airplanes did not have many passengers. Just three or four strong-armed men without weapons could have taken over each airplane. The passengers and pilots might not have put up resistance. They probably felt that this was just another hijacking that would be over soon. Nobody could have imagined that the hijacker's plan was to fly these airplanes into the World Trade Center. As to how many died, 40,000 people work in the World Trade Center every day. Also, the major PATH Train Station is located directly under the World Trade Center and more than one hundred thousand people pass through that station every day. Several subway lines run under or next to the World Trade Center. Thousands of tourists visit the observation deck on top of the South Tower every day. Certainly nobody on the observation deck or on the floors above where the airplanes hit could possibly have survived. Some office workers who were inside have reported that they were told not to leave the building but to remain inside. Those few who have lived to tell about this are those who disobeyed orders and left anyway. Also, several hundred firemen, policemen and rescue workers are known to have died when the buildings collapsed, plus several television news crews and TV reporters are known to have been killed. The number of dead is probably easily 30,000 and may be considerably more. What about the Hazara of Central Afghanistan? The Muslim newspaper article for October 5, 1983: Ordeal of a Chitrali Girl II - Local officials in league with Sloan?